Life is full of BIG moments...the kind that alter it in such a way that things are never the same again. You know what I mean: births, marriages, divorces, deaths....your child going off to college! And the thing about those moments is, even the very happy ones can be bittersweet. Especially the ones that involve your children. You want your children to grow up...perhaps not as fast as they want to, but it is the goal, nevertheless. Even so, when those big moments arrive, there is a bit of sadness and trepidation. You want to still be there to look after them, make sure no one is mistreating them, protect them and take them back home with you. But, when your child is so very excited and you know he is about to do something that is so thrilling and wonderful, it takes a bit of the melancholy away. So...that is where I am. My oldest child and I headed to Auburn this past week to attend Camp War Eagle and get him registered for classes in the fall. And, yes, I was a mixed bag of emotions...proud, sad, happy, thrilled, nervous, worried. But the overriding emotion was one of excitement. How could I not be when he was so excited and happy? The grin on his face could not have been any bigger and I was getting to share in his happiness. There was no time to be sad. We had wonderful, exciting things to do. While we were in Auburn, we met up with J.D. 's good friend, Rhett, and his mom, Loretta, and made plans to take the boys out for a nice dinner. My friend, Susan, had recommended The Amsterdam Cafe a while back, so I suggested we try it out. The name Amsterdam threw me off a bit. I walked in, curious to see if the menu would include Dutch treats like bitterballen and stamppot, and wondering what on earth I would order. I was also not expecting for the entire restaurant to be decorated with pictures of Van Gogh. In all my conjuring about the name Amsterdam, I did not once think about the great Dutch painter! My favorite of all the paintings of the Dutch master was this whimsical painting of Auburn Van Gogh. 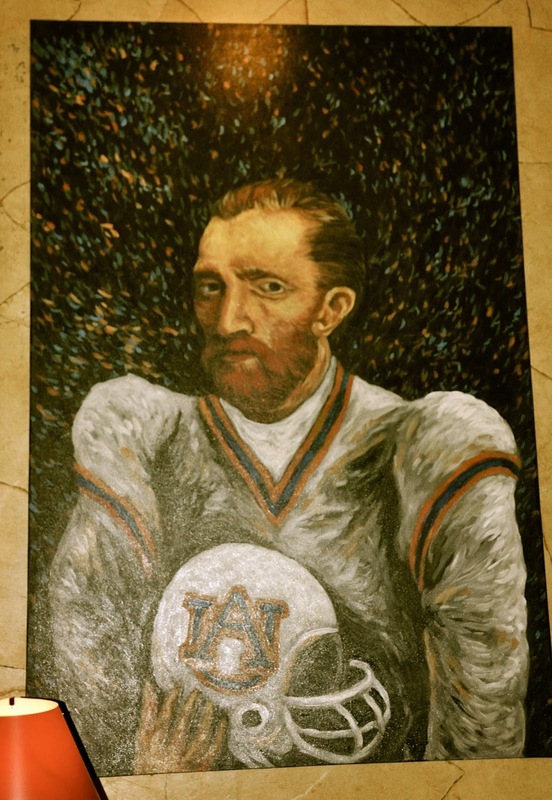 Of course, Van Gogh was a Tiger fan! I know for sure this is an AUthentic painting! Turns out, the idea for the name, Amsterdam, came from the restaurant founder's handmade Shulbok tables. What is a Shulbok table, you ask? Never fear, I already researched that for you! Shulbok is apparently a game based on a traditional Dutch shuffleboard game called, Sjoelbak, which has been popular for several hundred years in the Netherlands, Belgium, Germany and England. Who knew, right? The handcrafted American version of the Shulbok table traces it's roots back about twenty years to (drumroll, please) Auburn, Alabama's Amsterdam Cafe! Now that I know this, I am determined to learn how to play Shulbok! So what did we order? We started out with black-eyed pea hummus, which came with red and green bell peppers, cucumbers, assorted olives and lahvosh. Now, normally, I am not an olive eater, but as I was eating the hummus, I kept thinking it needed a bit of salt and olive oil to perk it up. I didn't want to start making adjustments since I was sharing the dish and I really wasn't sure if everyone else would appreciate my tampering with the hummus, so I just kept my thoughts and seasonings to myself. But then it dawned on me...they served it with olives. Olives are salty and olive oily! I tried a bit of the hummus with an olive and ..tada! It was perfect! I guess that is why they serve it with olives! Sorry, but we were so hungry at this point I completely forgot to snap a picture! For my entree, I noticed on the menu, a crabcake and avocado sandwich which had made the top 100 dishes in Alabama. This was a no brainer for me! 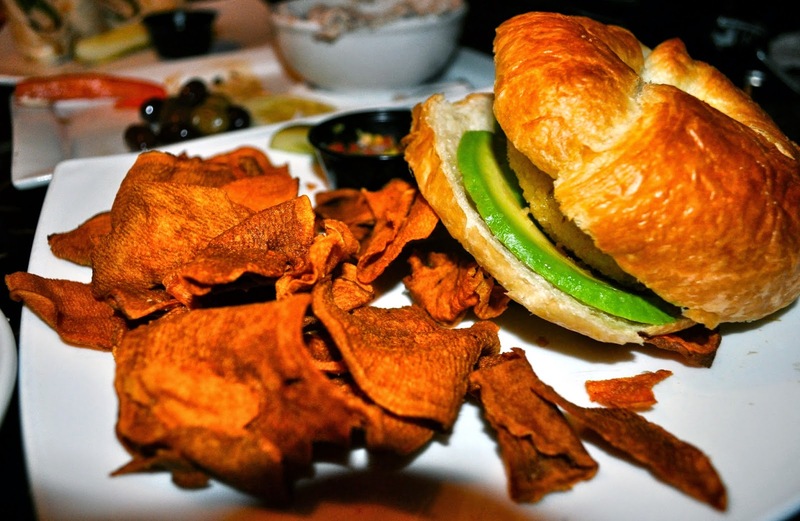 The croissant was filled with a lump crab cake, sliced avocado, creole remoulade, and mango pico de gallo. It was accompanied by homemade sweet potato chips. It was yummy and filling. I could only eat half the sandwich and my child, who normally will not touch an avocado, scarfed down the remaining half in two bites! This was after he had finished his Black and Bleu Rib-eye Sandwich with horseradish creme fraiche on a toasted hoagie roll. He really enjoyed his sandwich, too! 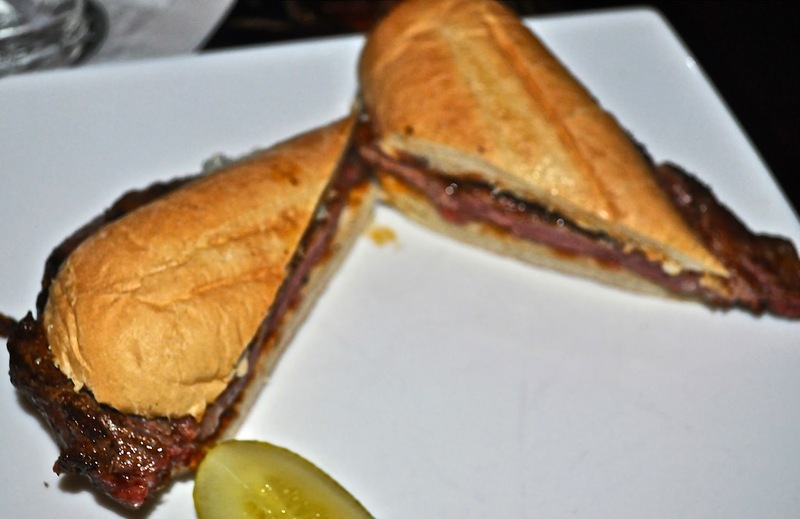 Rhett ordered a pepperjack grilled chicken sandwich which looked delicious and must have been because he ate it all! 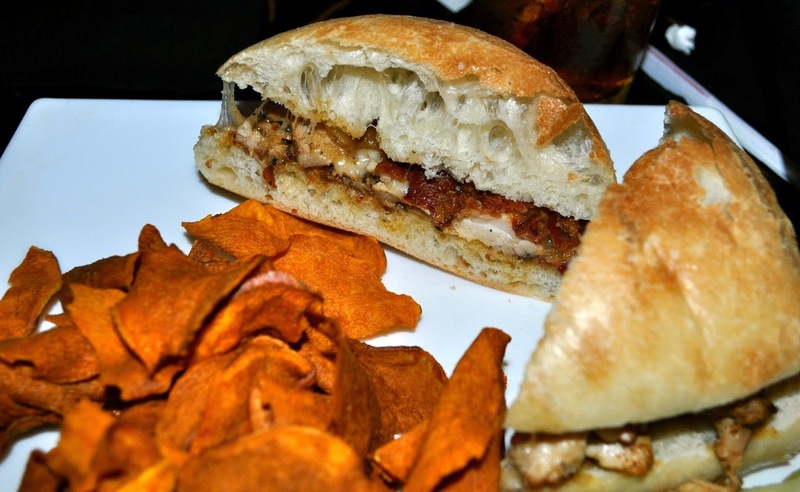 His sandwich also came with the sweet potato chips. Both JD and Rhett had Caesar salads to go with their sandwiches. 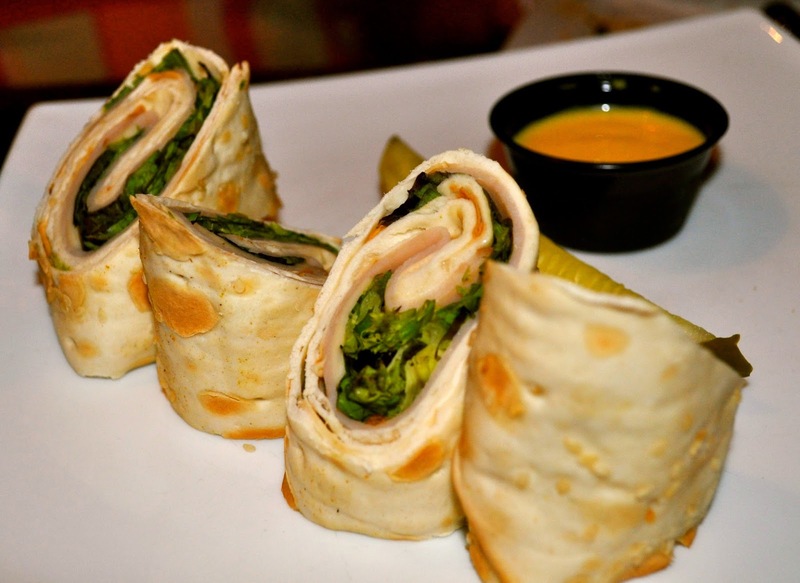 Loretta ended up with an Amsterdam turkey wrap featuring smoked turkey breast, swiss cheese, cream cheese and lettuce rolled up in a softened lahvosh wrapper with honey mustard for dipping. She liked it a lot. We were so relaxed and content after our meal that Loretta played a happy little tune on an Andy Warhol style piano she spotted just outside the restaurant. As for the rest of Camp War Eagle, it was a huge success. Loretta and I were thoroughly confused and exhausted. The boys were also worn out, but in a really good way. They got their fall class schedules completed and were able to get all the classes they wanted/needed. In fact, they were having so much fun, Loretta and I left them in Auburn (with MY car) to attend some fraternity rush events. They may never come home! War Eagle, everyone! Three Friends and a Fork gives Amsterdam 3 heerlijk (delicious) Yums UP!